At walking distance from the historic centre of Ripatransone, beautiful renovated farmhouse for Sale, in a fantastic panoramic position. 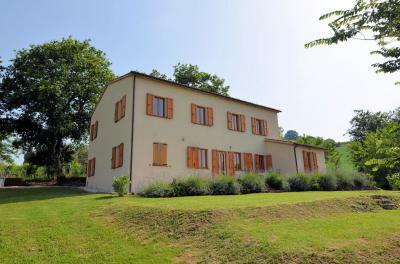 The House has two floors, for a total of 180 sqm renovated in 2009. The ground floor is going into storage for tools, various storage rooms and two bathrooms. The entire floor is nicely decorated with flooring and heating included. On the first floor there is a nice apartment to move into comprising large kitchen, living room, bathroom and a bedroom. From the kitchen you can go directly to a wonderful panoramic terrace overlooking the Sibillini mountains. The garden surrounding the House is well maintained with enough flat space adorned with fruit trees, oleanders, roses, olive and delicious wooden pergolas where you can stay and enjoy the view. 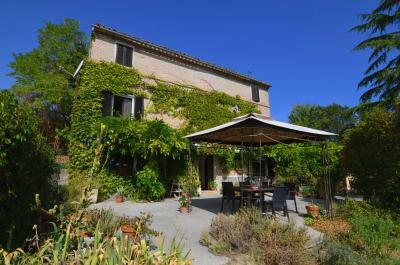 The property includes approximately 3 hectares of farmland. Perfect solution for those seeking a holiday home near the sea but a short walk from the old town.